I decided to go buy a motor so I went to Glenwood Sales (549 Hague St.) and browsed for a while before eventually settled on a 30 V stepper motor with a 48 ohm coil. It apparently has 4 phases, and each phase would ordinarily consume 0.625 A or 18.75 watts. 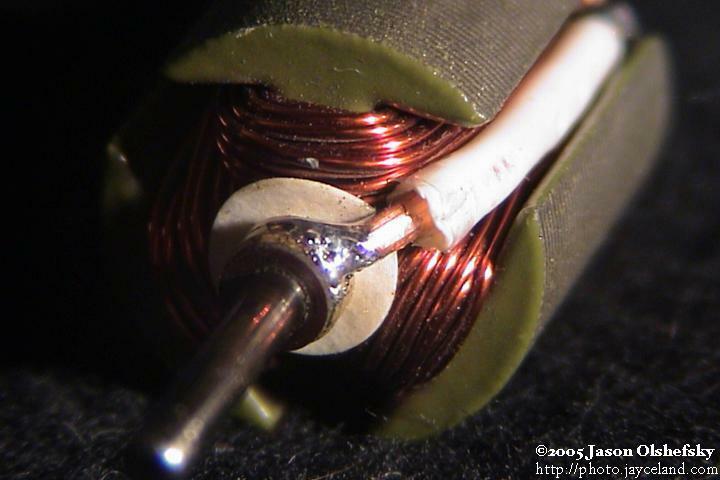 The stepper motor could generate as much as 50 volts open-circuit (it's wired with two coils center-tapped.) Through a 51-ohm load I found it could get as high as 5 volts, and through a 280-ohm load, 20 volts. The good news is it's pretty linear from about 1,000 RPM through 3,000. The bad news is those two ratings yield only 0.5 watts and 1.4 watts respectively. 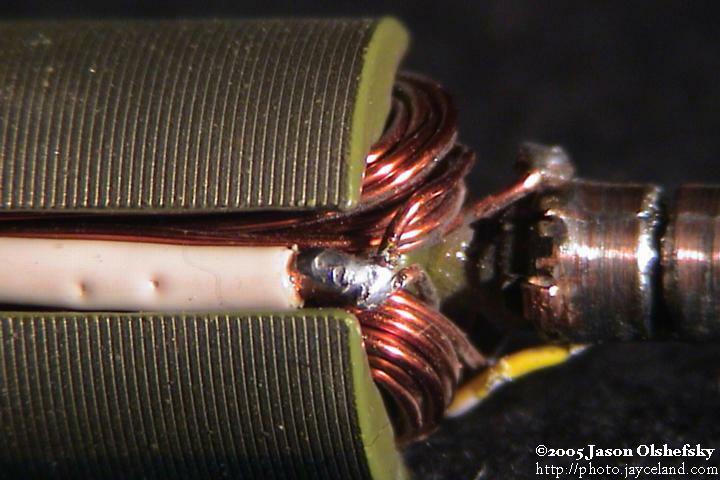 Using a full-wave bridge on each side and tying the outputs together and running at 3,100 RPM, I could get 9 volts into 51 ohms and 34 volts into 280 ohms: 1.6 watts and 4.1 watts respectively. Open, it would generate 90 volts. Indeed, none of the motors would source more than a half a volt at 3,100 RPM; one that I hadn't tested would generate 0.5 V and 1.5 amps, so at least that's promising. Starting from the original 3-pole rotor. 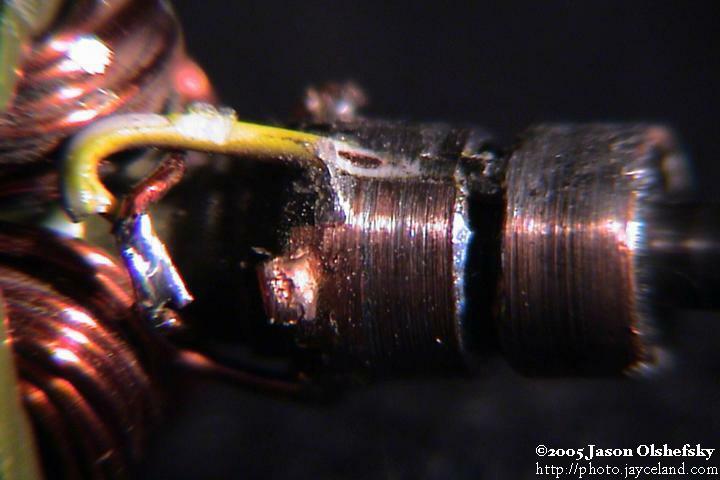 ... that is soldered to the bushing, electrically tying it to the motor case. 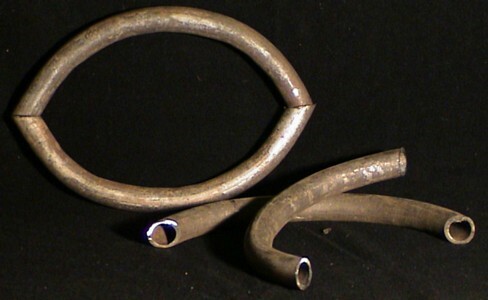 I found that I have some 1" thin-walled tubing from an exercise machine that has a nearly 22mm diameter — the outside diameter of the bearings I bought. I figure I can weld a piece of tubing to the ends of the windmill frame then cut a slot and use a seat-post clamp to grip the bearing. I also tested the motors I had selected as candidates for a 10-watt generator. None of them performed better than the motor I had originally selected. Ok, so let's say I limit the motor to 15,000 RPM at maximum wind speed of 70 MPH, or 2,100 RPM. The ratio, therefore, is 7:1 … bummer. I think I'm going to need to get a different motor. If I use 21,000 RPM as the cap, I can get to a ratio of 10:1, so in a 10 MPH wind, the rotors would only run at 300 RPM driving the motor at 3,000 RPM which isn't enough. None of the bicycles I have currently have the correct dimensions for using the triangular front-end as-is on the back of the Bike With 2 Brains, so I'll have to custom build those parts. It's probably for the best anyway since I don't like the size of any of the top brackets. I redesigned the frame with a rounded top and moved the rear wheels as wide as the edges of the seat. Prior to deciding to make the top frame rounded (which is an aesthetic choice) I had to make the eyes (in full scale) to test that I could indeed bend Schedule-style steel pipe with the hydraulic bender I have. I moved the rear wheels further apart for aesthetic and practical reasons. 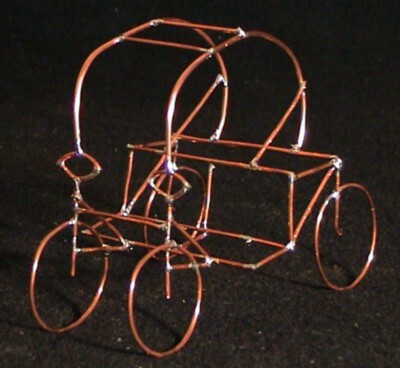 Aesthetically, the copper model looks like forward is indeed forward owing to traditional conventions of wider wheelbases in the rear of vehicles. Practically, 24-inch diameter wheels would hit one another if the axis of rotation was only 24 inches apart. I think it's a good decision because it'll improve stability as well — the only downfall is that it's not so clear how I want to make the whole frame come apart so I can transport it. I noted that the full-spectrum LED's I'm looking at from LSDiodes.com have the following voltages: 2.05 volts for red, 3.2 volts for green, and 3.6 volts for blue; all at 35 mA. Thus, to be driven at full brightness from 5 volts, I'll need an 84 ohm resistor (the closest standard value is 82 ohms) a 51 ohm resistor, and a 40 ohm resistor (closest being 39 ohms.) 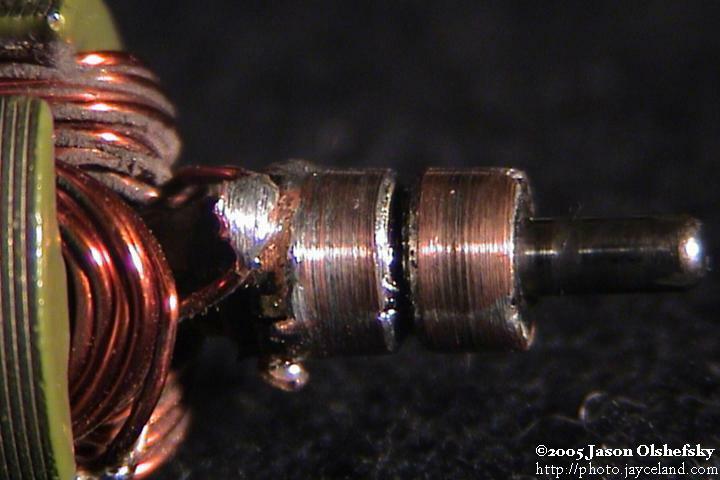 The 84 ohm resistor will drop the most amount of power at 0.1 watts, so pretty much any size is safe. While I'm at it, driving one of these LED's with all elements on at full brightness is 310 mW, so if I'm to limit the lighting to 6 watts or so, I can only use about 20 LED's at a time … of course, I can just program it so it's not trying to turn on all the LED's white at once. I put in an order at Mouser.com for the resistors (I had to swap the 82-ohm resistors for 75-ohm since they were out of stock) a bunch of 10 µF capacitors (I already have 48 so I bought 50 more, expecting to wire in no more than 32 LED's) and a bunch of 2N3906 PNP general purpose transistors that I'll use with 74LS138 3-8 multiplexer chips to drive the cathodes of the LED's. I decided to build the eyes first. I have some pieces of Schedule-type steel pipe which I wanted to make sure the pipe bender I have can actually bend it — and in a controllable way. I also tested to see if I would have to strip the pipe to bare metal but it appears I can just use a wire brush to knock off the loose zinc and rust for the paint to stick. I decided to do the "LED experiment:" how fast can I charge a capacitor with a silicon 2N4123 transistor current follower — something like 10 µF — and how long will it for its charge to dissipate through the LED? In other words, how many LED's can I continuously refresh using this technique? My 20 mA LED that drops 2.2 volts will need about a 340 ohm resistor. It takes about 240 µs to charge a 5 µF capacitor to nearly full voltage — about 500 µs to squeeze in the last few millivolts. Dissipation takes only 650 µs to fall a full volt. After a few iterations, I settled on a Darlington follower which drops the charge-time to 20 µs. Given a 1 µF capacitor, the rise time is below 10 µs and the decay runs for about 215 µs. If I move up to a 5 µF capacitor, the rise time stays below 10 µs but the decay jumps to 650 µs. If I then move up to a 10µs capacitor, the decay of 1 volt loss jumps to 1.4 ms. Comparing to the prior pulse-width modulated test, I found the duty cycle needs to be about the same for the same brightness: 28 µs of the 2.1 ms cycle time or 1.3%, so I can theoretically drive 75 LED's in a perfect world.